IN celebration of the upcoming August 5th "National Coloring Day" we're showing some of our favorite experiences -- whether it's for creative inspiration or just the love of coloring complicated, detailed patterns -- by any name -- these tessellations or techellations will make you crazy with glee! More than 30 hypnotic designs form delightful distractions for dedicated colorists. The full-page patterns feature stars, geometric motifs, and other interlocking shapes that create eye-popping optical illusions and three-dimensional effects. Pages are perforated and printed on one side only for easy removal and display. 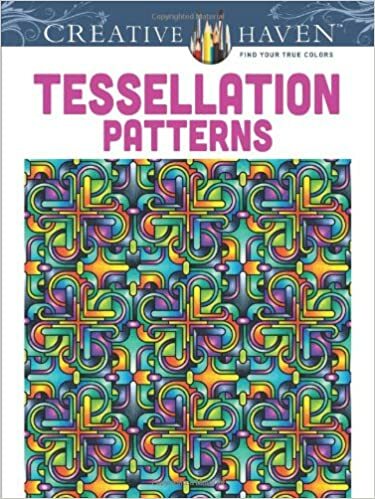 So, it goes without saying that while the art and math is called "tesserlation" Dover books and artist John Wik have given it their own brand Techellations -- and brings two superb coloring books on the topic where you get a wonderful launch pad into this wonderful world of patterns . . . so color on! Click to enlarge, or take the slide show! Enjoy these as idea starters, or just fun passtime! You'll enjoy the experience! Follow the adult coloring revolutions in the Design Center! M. C. Escher once said ... "Only those who attempt the absurd will achieve the impossible. I think it's in my basement... let me go upstairs and check.